Alex Pheby was born in Essex and moved to Worcester in his early childhood. He currently lives in London, where he teaches at the University of Greenwich. His first novel, Grace, was published in 2009 by Two Ravens Press. 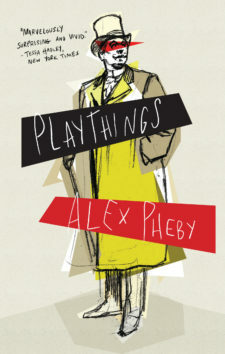 His second novel, Playthings—about the life of the Daniel Paul Schreber—was published in 2015 in the UK by Galley Beggar Press. Widely acclaimed in media from the Guardian to the New York Times, and called “the best neuronovel ever written” in the Literary Review, Playthings was shortlisted for the 2016 £30,000 Wellcome Book Prize.